Whether you’re adding embroidery to your range of apparel decorations, or starting an embroidery business, DecoStudio is the perfect place to set your anchor stitch. 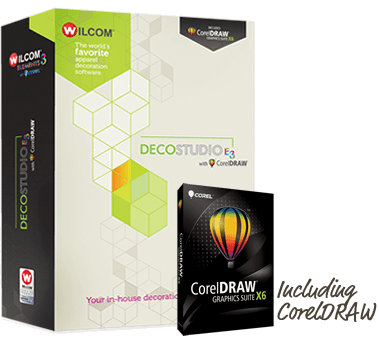 Wilcom’s renowned stitch technology integrated with CorelDRAW Graphics Suite X6, makes DecoStudio the easiest way to create stunning embroidery, printing, laser cutting, rhinestone designs and more! DecoStudio e3 is an all-in-one graphics and embroidery software solution for creating brilliant multi-decoration designs, visualizing them on screen and automating the design digitizing process to effortlessly reproduce your concepts on real-world objects. Regardless of your skill level, DecoStudio e3 will help transform your ideas into professional-quality results. From vector to embroidery and appliqué designs, everything will be a cinch! It’s your business. Choose the Elements you need. Add as your grow. DecoStudio is a quick and affordable way for start-ups to digitise their own embroidery designs. The interface has a simple set of tools to carry out basic editing and digitising tasks. Open artwork in graphics mode and convert it to embroidery without the need for any technical know-how. Embroidery files stitched on one type of fabric can look totally different when stitched onto another, this happens because fabric stretches as it sews which distorts the design. It’s a real problem and particularly noticeable on text. Correct use of underlay, stitch density and other complex settings fix the problem but they take some time to master. In DecoStudio you pick the fabric type you’re working on and the software manages the settings for you. The following are the minimum and recommended system requirements for the Wilcom embroidery software. Wilcom e3 software is compatible with Windows 7 and Windows 8 operating systems. If you prefer you can also run Wilcom software on a Mac.